Porcelain veneers can mask undesirable flaws, like stained or discolored teeth from tetracycline, chipped teeth from injuries and damaged teeth from a root-canal procedure. Patients with gaps between their teeth that are chipped or worn should consider porcelain veneers. Dental veneers have a longer life expectancy and color stability than bonding and are highly resistant to staining from coffee, tea and even cigarette smoking. 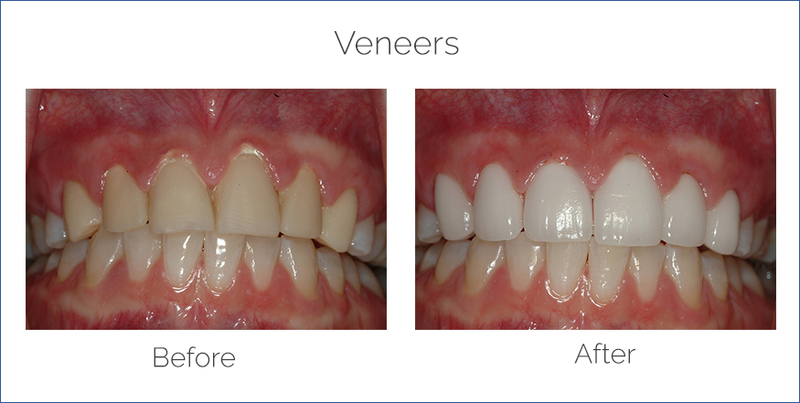 Veneers are usually irreversible because it’s mandatory that Dr. Vito removes a small amount of enamel from your teeth to accommodate the added thickness of the veneer. After the Diagnosis and Treatment Planning appointment, a veneers candidate will undergo a Tooth Preparation and Impressions procedure. Usually lasting one to two hours, the teeth are lightly buffed to allow for a small added thickness of the veneer. About a half millimeter of the tooth is removed, which may require a local anesthetic. During the same visit, a mold is taken of the teeth and sent to the laboratory for the fabrication of the veneers. Veneers are typically made by a dental lab technician with your desires and goals in mind. During the Placement visit, also about one or two hours, the veneers are placed on the tooth surface with water or glycerine and a discussion is held between you, the dental ceramist and Dr. Vito to make sure everyone is happy with the aesthetics before the final cementation of the veneers. While the veneers are resting on your teeth, they can be adjusted with various shades of cement to match the color of your teeth. To apply the veneer, the tooth is cleansed with specific chemicals to achieve a bond. Once a special cement is sandwiched between the veneer and the tooth, a visible light beam or laser, causes a catalyst to be released, hardening the cement. Porcelain veneers will typically last around ten years, and in some cases, twenty years or more. Certain patients may be eligible for a no preparation veneer if certain requirements are met. Ask Dr. Vito if you qualify. Lumineers or no prep veneers, provide the same function as porcelain veneers. However, are thinner than veneers and made for less severe dental issues. Speak with Dr. Vito to determine what will best suit your needs and expectations. If you are a candidate for Veneers in the Philadelphia or Main Line area, call the office of Dr. James Vito today (610) 971-2590.